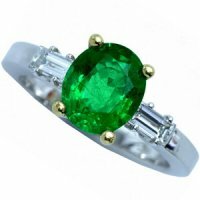 Stunning Emerald and Diamond Solitaire Ring. 18k - 750. A sensational emerald single stone ring, composed of a vibrant, oval emerald, weighing 2.12 carats, in a 4 claw 18 carat yellow gold setting, to a white gold shank. The baguette diamond shoulders, consist of two baguette diamonds, weighing 0.58 carats, set in an 18 carat, white gold setting. 18ct - 750.